A combination of Spandex two-way stretch material, goatskin leather, and neoprene make the HDX 3 glove one of the most flexible, comfortable gloves in the Cortech lineup. • Nappa goatskin leather backhand with a goatskin leather palm. • Molded, matte finish one-piece knuckle provides increased protection. • TOUCH leather in the pointer finger and thumb allows the use of mobile devices with your gloves on. • Breathable, four-way air mesh material in the thumb, fingers, and top of the hand. 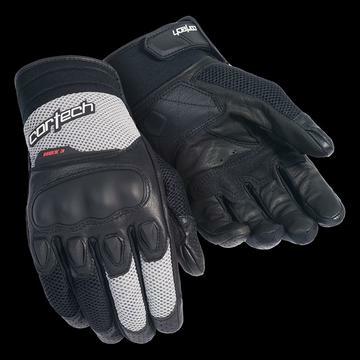 • Perforated goatskin fingertips offer additional ventilation. • Clarino™ thumb panel helps to minimize wear from the grip flanges. • Goatskin leather palm with ergonomically designed palm patch is configured to increase grip comfort. • Two-way spandex finger panels help reduce hand fatigue and improve dexterity. • Neoprene wrist panel provides flexibility and increased comfort. • TPR molded wrist cuff closure features a reliable hook and loop closure.